one king-size and two full-size beds, 2 full size sofas. 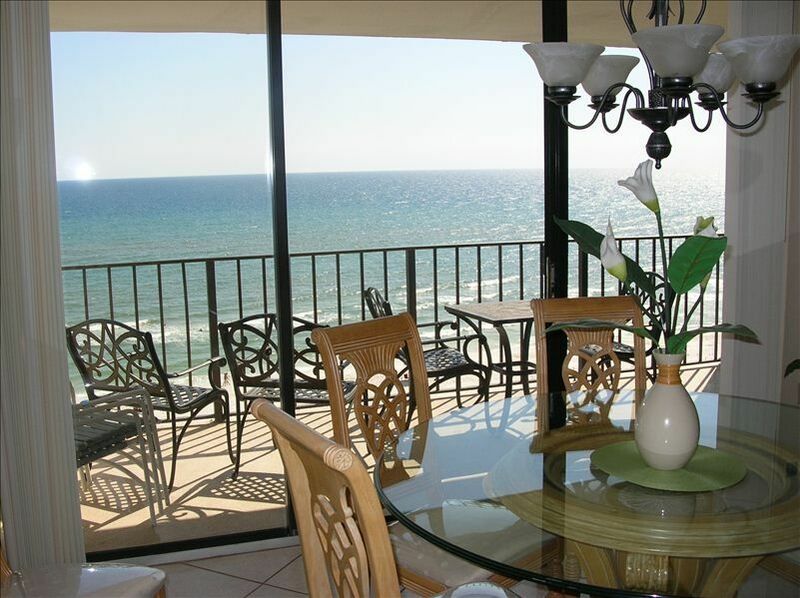 Gulf/beachfront condo is situated in the highly acclaimed Edgewater Beach Resort in Panama City Beach, Florida. The balcony overlooks the pool, hot tub, and pristine white sand beach. The large living room has two full-size sofas. The windows are floor-to-ceiling which gives you a full view Pets are NOT allowed. The Resort amenities include a beautiful Lagoon Pool, nine hole golf course, 12 tennis courts, two restaurants, and a hair/tanning salon. The Pier Park is a short distance as are shopping and restaurants. Water sports rentals are also available. A new Fitness Center now available for guest use. Charges for certain amenities may apply. Owners at Edgewater since 1991.. Live near Cincinnati, OH. Retired. Love Panama City Beach. Call or email regarding deposit and payment. Edgewater Beach Resort is awesome! You will love it! The pools, hot tubs, emerald green gulf, white sands, golf course, and kids play area by Lagoon pool. Airport, Pier Park, St Andrews Park, all close. The property was a little dated, but for the most part it was clean . I had never did VRBO before, so was a little nervous about it. Thanks to Joan and her communication with me, it made the experience stress free. I would recommend Joan and her condo to anyone. Thank you for the review. We are working on the king bedroom dated wicker furniture. You had to like the new living room leather furniture though. Hopefully you will want to stay again and use our new bedroom king furniture. Was great working with you. Once again we enjoyed our stay at Edgewater. The property is very family friendly. The 2 Bedroom Condo had a very nice design with the dining area and living room facing the gulf side with Windows across the entire rooms providing a very nice view. The unit was clean...updated and very well stocked in the kitchen with everything needed for cooking. Thank you so much for the kind review. Hope to hear from you again and you have a great year. The Loos Condo was really nice and we enjoyed our stay. Thank you for the kind message. We sure hope you will want to stay with us again. Have a good year. The condo is very well furnished in all areas, kitchen, bath, etc so we had everything we needed. The pools here are great, 2 smaller lagoon pools at two of the towers, and one large one at the center tower where the Restaurant is located. 3 hot tubs and easy access to the beach where chair rentals are available. Had a great stay and would choose this condo/owner again. Thank you so much for the kind words. We do hope you want to stay again. Joan's condo is by far the best of all the condos we have stayed at when visiting Edgewater Beach Resort. Upon arrival everything was spotless and beautifully decorated. There is an amazing view of the ocean and sunsets from the balcony. We will definitely come back to her place in the future. Very comfortable condo!! We felt right at home. The view was amazing. We had a wonderful time and would recommend this unit to everyone!